This page offers a varied collection of resources on the life and works of Marlon Riggs. We have commissioned essays by scholars on the use of his films in the classroom as well as the influence of his documentary vision and practice on subsequent media artists. There are links to scholarly and popular articles about Riggs� oeuvre and reactions to his most controversial film, Tongues United. 2019 marks the 30th anniversary of the premiere of Marlon Riggs' groundbreaking documentary Tongues United. This year, programs are taking place in the US and internationally to recognize Marlon and his body of work. I Shall Not Be Removed, the only documentary on Riggs� life and work can be streamed in its entirety for free on this page below. It provides an intimate portrait of the groundbreaking documentarian. We also provide a link to watch the historic event in February 2013 celebrating Riggs at Harlem�s Schomburg Center for Research in Black Culture. There are opinion pieces by Riggs about his media activism, his fight for racial and gender justice, against homophobia and racial essentialism. The Marlon Riggs Papers, a wealth of production notes, letters and media have very recently become available at Stanford University; our site provides information about how to access this valuable new archival resource. This 58 minute film biography by Karen Everett provides a compelling portrait of Marlon Riggs and the profound impact his work has had on colleagues and the culture. The documentary traces his development from a precocious childhood in the close-knit African American community of Fort Worth, Texas, through his political awakening at Harvard, to his final years as a courageous advocate for free expression and on behalf of stigmatized people everywhere. Clips from all eight of Marlon's films show how he evolved a unique experimental documentary style, mixing poetry and criticism, the personal and the political. A Marlon Riggs Retrospective, February 26 2013. Panel (from left to right) included Cornelius Moore (California Newsreel), moderator Steven G. Fullwood, Rhea Combs, and Al Cunningham. Streaming under the auspices of the National Black Programming Consortium. On Marlon Riggs: The Artist and His Influence by Rhea Combs. Rhea Combs is a Curator specializing in the Media Arts at the Smithsonian National Museum of African American History and Culture and author of Exceeding the Frame: Documentary Filmmaker Marlon T. Riggs as Cultural Agitator. E. Patrick Johnson is Prof. of Performance Studies and African American Studies at Northwestern University. He is the co-editor of Black Queer Studies: A Critical Anthology, and author of Appropriating Blackness: Performance and the Politics of Authenticity, Sweet Tea: Black Gay Men of the South – An Oral History, and Black. Queer. Southern. Women – An Oral History. 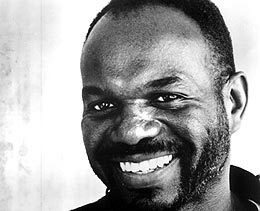 The Marlon Riggs Papers in the Stanford University Libraries documents the life and career of the documentary director, Marlon Troy Riggs (1957-1994). The majority of the materials in the Collection are from the period between 1984 and Riggs' death in 1994, the decade of his concentrated film-making activity, as well as more personal materials from the late 1970s onwards. The Collection consists of manuscript papers, films, and videotapes in various media formats, over 110 linear feet of material in all. The manuscript papers include notes, correspondence, writings, and office records. Their meticulous organization reflects Riggs� care in documenting his own work, ranging from his production process to the reception and controversies surrounding his work. For example, one important topic documented in the Papers is the bold, barrier-breaking use of the fair use copyright exemption in Riggs' sampling of broadcast materials in Color Adjustment. CBS challenged Riggs over the use of footage from the Amos 'n' Andy show to document racial stereotyping in broadcast television. The collection includes footage Riggs obtained of the "The Rare Coin" and other episodes, interviews and voice-overs related to his portrayal of the show, and tapes which reveal his editing of this material. These documents are supplemented by files that provide information about the acquisition of materials, interviews, mixing logs, production notes from the Amos 'n' Andy television show, and the difficulties in obtaining copyright clearance for materials used in Color Adjustment. Similarly, the collection documents the national debate unleashed by Tongues Untied with respect to public funding of controversial works and other critical moments in the reception of Riggs� creative work. In total, the Riggs Papers provide essential documentation for research on Riggs� life and oeuvre. The Collection is available to the public for research use in the Department of Special Collections, Green Library, on the Stanford University campus. A complete guide to the collection is available through the Online Archive of California. Please consult the on-line guide to requesting materials and reprographic services for more information on use of the Riggs Papers. Right after the 1991 public TV broadcast of Tongues Untied, in the POV series, Riggs criticized PBS for its cowardice in the face of censorious Congressional attacks which demanded that PBS and NEA funding be eliminated. He also lamented the lack of support from mainstream African American leadership and opinion-makers. Riggs�s article appeared in the August 12, 1991 edition of Current, the publication dedicated to public media. When 1992 Republican presidential hopeful Pat Buchanan illegally excerpted a section of Tongues Untied in a campaign ad, Riggs responded in a October 6. 1992 New York Times op-ed criticizing the demagogic use of male homosexuality and race to frighten segments of the U.S. public. Riggs entitled the piece �Meet the New Willie Horton� to reference another fear mongering campaign ad from the George H.W. Bush's 1988 presidential campaign. Riggs� interview provides the most illuminating and incisive window into his overall perspectives on race, gender, sexuality, social change and media representation. Posted here is a review of Tongues Untied by Black gay critic, Cary Alan Johnson who called it �the film we�ve been waiting for�. He praises its innovation and complex and intimate portrait of the Black gay experience. He lauds how it �skillfully draws the connection between the oppression and anger of African American gay men and that of the Black community as a whole�. However the film�s last line, �Black Men Loving Black Men is the Revolutionary Act� raised questions for him upon discovering that Marlon Riggs� partner was white. Riggs addressed the complex meaning of the statement in the aforementioned Release Print interview; however, it continues to be brought up after screenings of the film. Cary Alan Johnson, �Not in Knots: Tongues Untied is the Black Gay Official Story.� Gay Community News (Boston, February 25-March 3, 1990). There is a chapter on Marlon Riggs in the book Queer Pollen: White Seduction, Black Male Homosexuality, and the Cinematic by David Gerstner. The other chapters are on writers James Baldwin and Richard Bruce Nugent. Study guide for Black Is...Black Ain't, Transcripts for Ethnic Notions, Color Adjustment, and Black Is...Black Ain't. A compilation of 3 works by pioneering filmmaker Marlon Riggs addressing issues of black gay male identity and confronting HIV/AIDS. Marlon Riggs's final film debates Black identity, white critiques, sexism, patriarchy, homophobia, colorism and cultural nationalism. Marlon Riggs' study of how network television absorbed deep-seated racial conflict into the non-threatening formats of primetime television. Clips from Amos 'n' Andy, Good Times, Roots and The Cosby Show among others are intercut with interviews with producers, cultural critics and actors. Scholars shed light on the origins and consequences of anti-Black stereotypes in popular culture from the Antebellum period to the Civil Rights era. A landmark and controversial personal documentary essay on experiences of black gay men and the search for identity. It has been critically acclaimed as one of the most important documentaries of the 20th century.